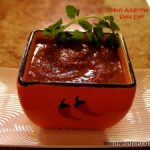 A homemade & most addictive salsa ever. Paleo and low carb. No one can resist this Salsa’s tasty charms! People will stalk you for the recipe.. If you are paleo, this can be used on eggs, meat, seafood and veggies. No one can resist this Salsa's tasty charms! People will stalk you for the recipe.. If you are paleo, this can be used on eggs, meat, seafood and veggies. Can also dip almond crackers, or veggies into as well. 3 Tomatoes chopped and seeded. place chopped tomatoes, garlic cloves, and peppers on baking sheet, with skin side up. drizzle or mist veggies with olive oil. Add all ingredients, including slightly cooled veggies, into a food processor or blender. Process until well blended ,or the thickness you prefer. 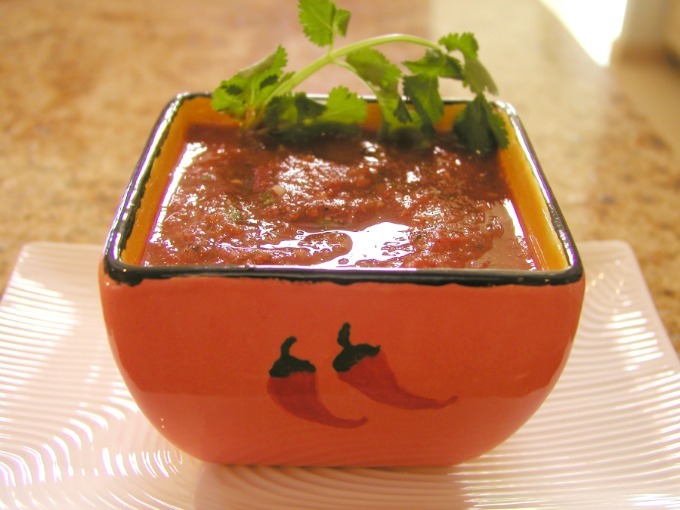 This Salsa is even better the next day, as the flavor intensifies. What paleo things do you recommend dipping this salsa in. I used to love salsa and chips pre-paleo. But now I don’t know what to eat my beloved salsa with. Any tips? Hi Roxxy, I love this question because I miss corn chips more than anything too. My friends like to dip veggies in it, but this is not the same for me. I want something chip like. I do have a recipe for an almond (chip-like) cracker I make, and if I was more organized, I would have posted it with the salsa. But, I guess I was having a mind fog moment that day. I will post it next. I also love salsa on eggs for breakfast. Question: Do you not pull the blackened skins off the tomatoes? (Carcinogens, carcinogens… :0/ ) Or do you just blend themup with everything else? Thanks! Hi Kristi, You could pull the skins off. But would probably be easier to bake them for a shorter time, and take them out before they get charred. I put mine in skins and all to get the fire roasted flavor, but I only let them get barely charred. But it is still very good if you pull them out of the oven before browning. Just have to watch them more carefully. Your right about the carcinogens, I should pull them out before they get charred!